The most important factor in having a great lawn is WATER. Read our FAQ for watering recommendations. The second most important factor to a great lawn is consistent weekly lawn mowing. The green part of the lawn, which is what we see, is only half of the plant. What you don’t see is the important root structure. 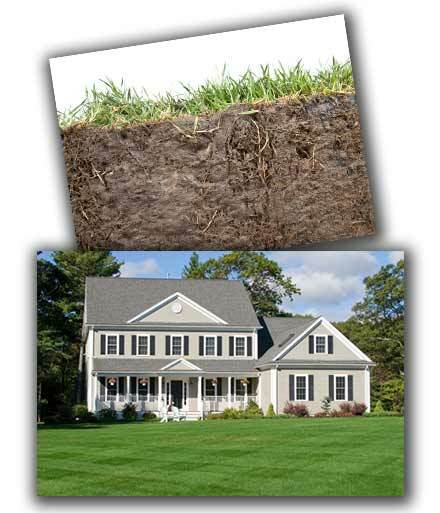 For a healthy and beautiful lawn there needs to be a balance between the green part of the grass and the roots. Because of our busy lives, it is common to let the grass grow too long. When we finally have time to mow, the roots have grown deep. Then, when the grass is cut to its proper height, the entire lawn can become unbalanced and stressed. If this happens occasionally, the lawn will be fine, but if it happens too often there will be big problems. The result is a blotchy, uneven and unhealthy lawn. If you’re letting your lawn get too long regularly, you are hurting the long term health of your grass and you’ll need to spend money to repair it in the future. It’s cheaper to pay a service like Just Cuts Lawn Service to make sure your lawn is properly cared for on a weekly basis season after season. We do this by cutting only the top 1/3 of the plant so the roots will grow evenly with the plant. And by leaving the small amount of mulched clippings, we are providing an added fertilizer that provides much needed nitrogen to your lawn. In addition, we use our organic fertilizer that is specially formulated for the Colorado climate. It gives your grass the food it needs to stay green all year.